Canon says this is its first L-series lens that has internal stabilization, providing up to four stops of stabilization. Close-focus distance is 2.8 feet (0.85 meters), and the lens acepts 77mm filters. The lens is relatively compact at 3.5 x 4.1 inches (88.6 x 105.4mm), although it weighs 33.5 ounces (950 grams). It will be available in November 2017 for US$1,599. Not content with just one tilt-shift lens, Canon announced three of them, which also are macro optics. The Canon TS-E 50mm f/2.8L Macro lens, TS-E 90mm f/2.8L Macro lens and TS-E 135mm f/4L Macro are all priced at US$2,199 each and will begin shipping in November 2017. As their names indicate, these are Canon’s premium L lenses, which account for the higher price. The addition of this trio gives Canon five tilt-shift lenses. 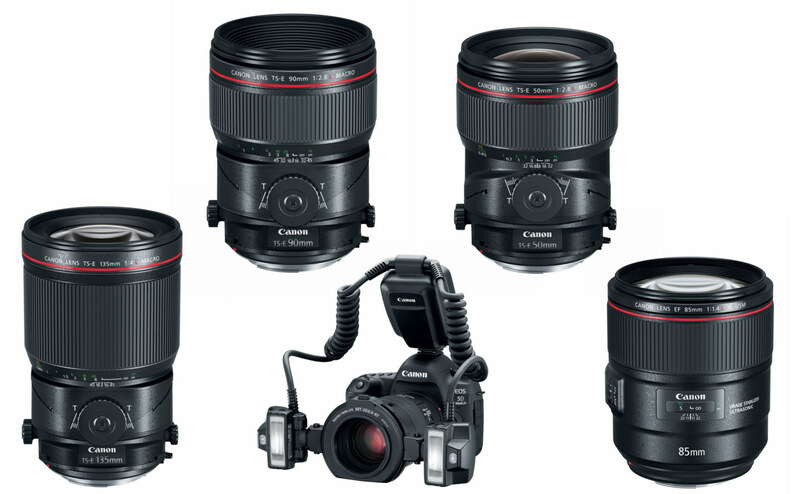 Canon currently has 17mm and 24mm tilt-shift L offerings. Like the 17mm and24mm lenses, these are manual focus only. This is because most people who these lenses will want precise control over focusing. These are intended for full-frame cameras but can be used when attached to an APS-C body, which have a 1.6X magnification factor. Each lens uses glass-molded aspherical elements, as well as ultra -low-dispersion elements. A new tilt-locking control for the the zero-tilt position prevents the lens from inadvertently tilting during shooting. Each of the lenses can be rotated 90 degrees to assist the photographer when shooting with the camera turned vertically. With the introduction of the three macro tilt-shift lenses, Canon also announced a macro light setup, the Macro Twin Lite MT-26EX-RT. This device places two small flash units near the front of the lens. The flash units can be fired simultaneously or independently to provide the photographer with greater control over the lighting of the subject being photographed. The kit includes two removable light diffusers and redesigned controls and information LCD module. The setup is powered by either a rechargeable battery pack or six AA alkaline or NiMH batteries. The entire unit (without batteries) weighs about 20 ounces (570 grams) and will be available in November 2017 for US$989.99. The Canon EOS EF f/1.4 85mm L can be used with full-frame and APS-C cameras. The Canon EOS TS-E f/2.8 50mm. The Canon EOS TS-E f/4 135mm. The Canon Macro Twin Lite MT-26EX-RT has twin flashes and a control module. The Canon Macro Twin Lite MT-26EX-RT control module mounts in the camera's hot shoe.